Yesterday, we announced that Appirio has acquired TopCoder, which, when combined with CloudSpokes, will become the world's largest professional development and design community with nearly 600,000 members! That’s more developers than Accenture, Deloitte and Infosys combined! Now, if you want to read the “corporate-speak” on the acquisition, you can check out our official press release or Narinder has a great post on the Appirio blog. However, I don’t work with marketing any longer (apparently I had a habit of tweeting prematurely) so I’m going to explain what I think it means to the developer community and customers. 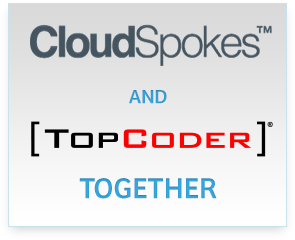 The CloudSpokes and TopCoder communities are a great fit and compliment one another nicely. CloudSpokes members are very strong in cloud technologies, APIs and mobile while TopCoders excel in design, algorithm and analytics. We envision many members expanding their skill sets by competing in new areas afforded by the merger of the two platforms. More Opportunities to Compete, Learn and Make Money! The acquisition will provide members of both developer communities with dramatically more opportunities to earn money while showcasing their respective skills and capabilities. Both companies represent marquee clients such as Google, Facebook, NASA, Salesforce.com, etc. and we’ve seen an instant uptick in inbound sponsor activity. This only means more challenges, more learning and more prize money for everyone regardless of their talents. We’ve been tossing around the idea for a couple of years now of doing a “mega-hackathon” where members compete to earn spots at the event. However, organizing an event like this is a daunting task for a small team. We are glad to announce that we will now be taking part in the TopCoder Open (TCO), a world-wide programming and designing tournament. It’s kind of a crazy event so take a peek at the video below or search for “TopCoder Open” on Youtube. As a part of our investment, CloudSpokes will add an additional track at the TopCoder Open happening November 10-14, 2013, for cloud development, as well as increases in prize money. CloudSpokes members should start receiving invites in the next few days. It’s gonna be absolutely nuts! At CloudSpokes we love learning new “things” and, of course, so do our members. We’ve sponsored free weekends at CodeSchool, written a large number of tutorials and launched a ton of “getting started” challenges to help member “learn more stuff”. We plan on making education a core foundation of the community. I love to teach and explain things so there might be something on the horizon for me (hint, hint). I have to admit that we’ve not done such a great job at profiles and badges at CloudSpokes. We’ve wanted to put stuff into place for awhile now but we’ve been waiting on some “developments”. TopCoder has some really cool profiles data (check out this sample profile) and we plan on tapping into that as well as adding a little “more stuff”. We’ve heard stories of a number of CloudSpokes members being offered jobs based upon the skills and experience obtained while competing in challenges. We’d like to make CloudSpokes member profiles portable so that you can proudly display yours anywhere you’d like. For customers, the combination of TopCoder and CloudSpokes gives us the technology, platform and community to create an “uber” cloud services provider. Need a custom design for your iOS app? We can do that. Need a killer algorithm for your Node.js app on Heroku? We can do that. Need a super-slick HTML/CSS layout for your Force.com Sites application? We can do that. Need some analytics skills for your Google BigQuery project? We can do that. I’d list all of the things we can do but it’s tl;dr. The point is, virtually every skillset that you need for application development you can find in our community. The best. The brightest. I eat, sleep and breath the Force.com platform every day. I love it (most of the time <g>). My goal is to get a significant number of our new TopCoder members developing on Force.com. Not sure if you know this but the platform is in need of more developers. I attended the SF Force.com Meetup last month and no less than 4 companies stood up and announced that they were hiring developers. I chimed up and ask if there was anyone in the room that was not hiring. Not a peep from anyone. So there you go. My “real” reasons why we acquired TopCoder. Just to boil it down to one reason: it’s gonna be #superfrickinawesome for everyone.